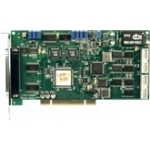 Universal PCI Multi-function card, 32 channel (single-ended or 16 differential), 12-bit Low Gain card for up to 44ks/s total sampling rate. 16 Digital Input & 16 Digital Output channels. 1k FIFO Buffer. Internal/external trigger. Universal PCI Multi-function card, 32 channel (single-ended or 16 differential), 12-bit Low Gain card for up to 44ks/s total sampling rate. 16 Digital Input & 16 Digital Output channels. Internal/external trigger. Universal PCI Multi-function card, 32 channel (single-ended or 16 differential), 12-bit Low Gain card for up to 110ks/s total sampling rate. 16 Digital Input & 16 Digital Output channels. 2 independantly programmable Analog Outputs. Internal/external trigger. Universal PCI Multi-function card, 32 channel (single-ended or 16 differential), 12-bit High Gain card for up to 44ks/s total sampling rate. 16 Digital Input & 16 Digital Output channels. 2 independantly programmable Analog Outputs. Internal/external trigger. Universal PCI Multi-function card, 32 channel (single-ended or 16 differential), 12-bit Low Gain card for up to 44ks/s total sampling rate. 16 Digital Input & 16 Digital Output channels. 2 programmable Analog Outputs. 8k FIFO buffer. Internal/external trigger. Universal PCI Multi-function card, 32 channel (single-ended or 16 differential), 12-bit Low Gain card for up to 330ks/s total sampling rate. 16 Digital Input & 16 Digital Output channels. 2 programmable Analog Outputs. 8k FIFO buffer. Internal/external trigger. PCI Multi-function card, 12-bit 16 channel (single-ended or 8 differential), High Gain, 1 Analog Output and 16 Digital I/O channels. 45ks/s maximum sampling rate. PCI Multi-function card, 12-bit 16 channel (single-ended or 8 differential), Low Gain, 1 Analog Output and 16 Digital I/O channels. 45ks/s maximum sampling rate. Universal PCI Isolated Analog Input card, 32 single-ended channels, 10ks/s max. sampling rate.